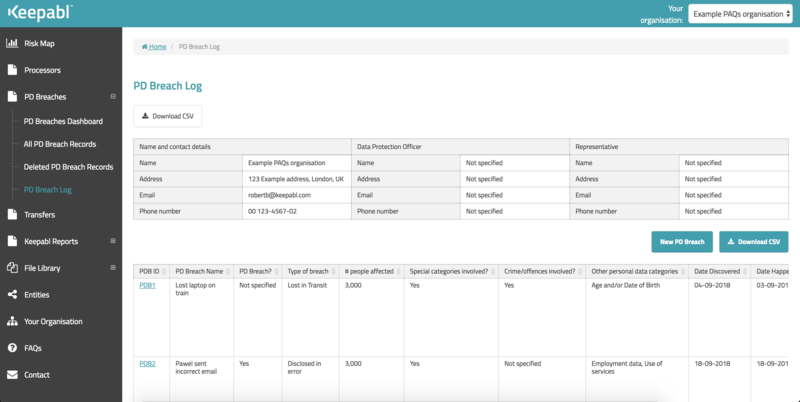 Record suspected or actual personal data breaches right into Keepabl, wherever you are, at any time. Completing the breach report ensures a uniform style and content of breach reporting no matter where your stakeholders are. And they don’t even need a Keepabl account! We provide a unique link you can use for a ‘breach button’ on your intranet or anywhere you wish. When someone clicks it, they won’t get access to Keepabl unless they’re a registered user, but when they fill in the breach report, it enters that information into Keepabl. 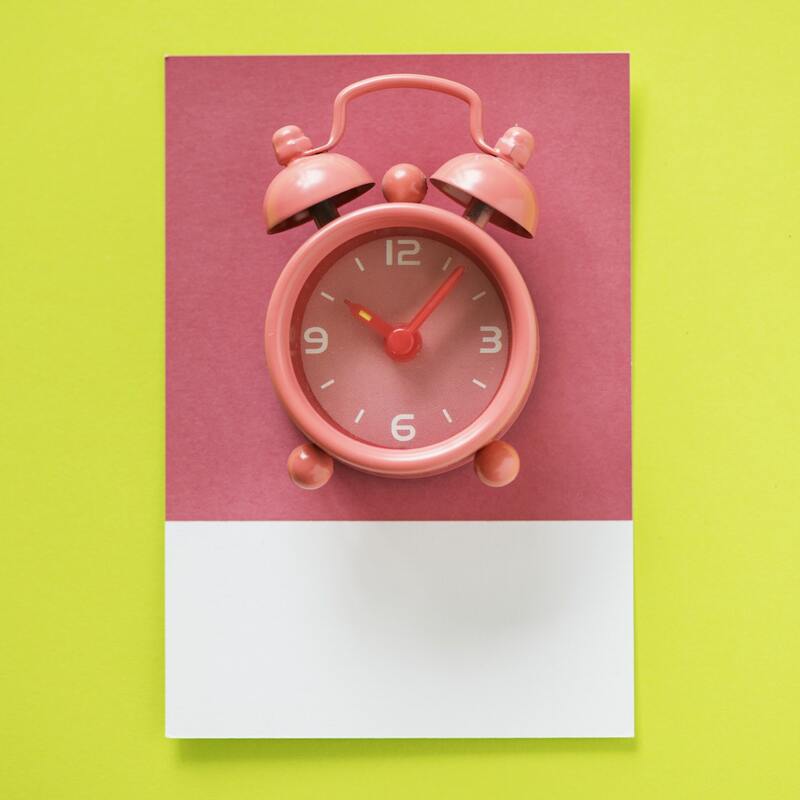 Given the short timeframe if a notification is needed, you need to get your response team in action fast! Keepabl sends email alerts as soon as a breach report is started. Just enter who you want to receive an email – alert your CTO, CISO, Privacy Officer or IT Security Provider – and react promptly and activate your response plan. Group companies can alert head office, and portfolio companies can notify their PE shareholder, so appropriate help is available to head off or manage a crisis. Don’t forget in the heat of the moment. Keepabl automates this key step for you. Horrendous though a personal data breach is, you have to react fast and record necessary information. The GDPR requires you to notify your supervisory authority (such as the UK ICO) within 72 hours of becoming aware of a breach unless it’s unlikely to result in a risk to the rights and freedoms of the individuals concerned (the data subjects). And if the breach is likely to result in a high risk to the rights and freedoms of the individuals concerned, you need to notify them without undue delay. When you create a breach report, Keepabl instantly and automatically creates your Personal Data Breach Log. Update your breach report and Keepabl instantly updates your Breach Log. 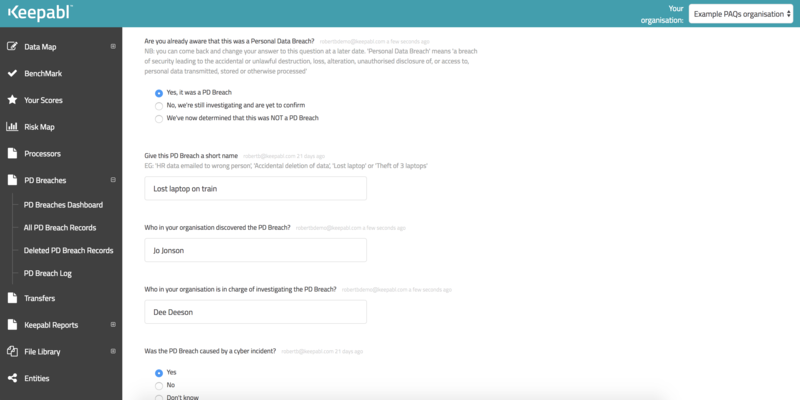 See what types of breach you’re suffering most, how quickly you’re closing incidents, and when you made notifications to authorities or individuals. Keepabl not only helps you gather and record everything to show you reacted well to a breach. It also nudges you to complete the information and provides guidance around when to notify, whom to notify and what to say.